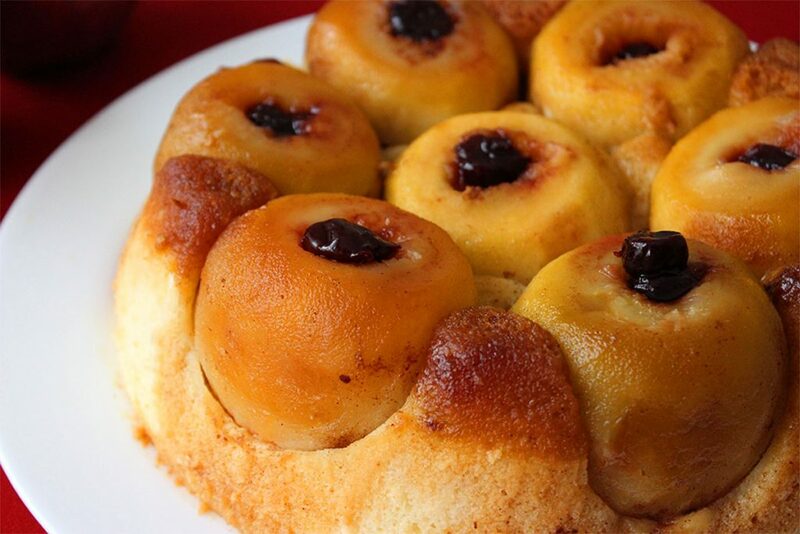 The upside-down apple cake is a favorite among Romanians. 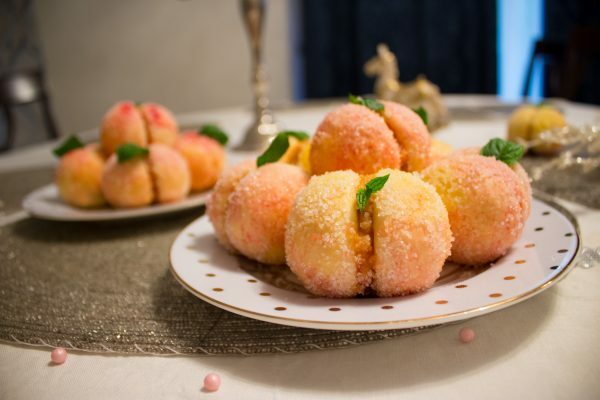 Our cook books include a wide variety of apple desserts, since it’s really easy for us to find this kind of fruit in our country. One of the most common recipes that include apples is our homemade apple pie, which consists of a thick layer of caramelized apples with cinnamon between two pie crusts. Since I’m saving the apple pie recipe for later, I wanted to make this light, fluffy as a cloud apple cake. In my family, we always like to bake something sweet at the end of the week. Since last Sunday I baked a chocolate cake, I wanted to switch it up a bit and try a fruit dessert. This upside-down apple cake is just sweet enough to make you feel like you’d have a second slice, but it also has a bit of tanginess to it, thanks to the bits of sour cherry preserve hidden inside the apples. When you prepare this cake, make sure that the caramel doesn’t turn brown. An overly-cooked caramel will make the cake taste bitter. 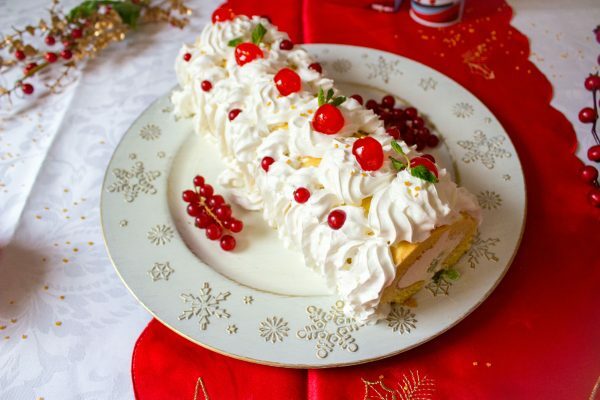 Then, when you prepare the sponge cake, make sure you beat the egg whites until they’re stiff, and then fold the rest of the ingredients gently. If you add the egg yolks and the flour and keep mixing, you will lose the air incorporated in the egg whites, and the cake won’t get fluffy. Another tip would be to let the cake cool completely before turning it upside down, or else the caramel syrup will collapse over the apple cake. 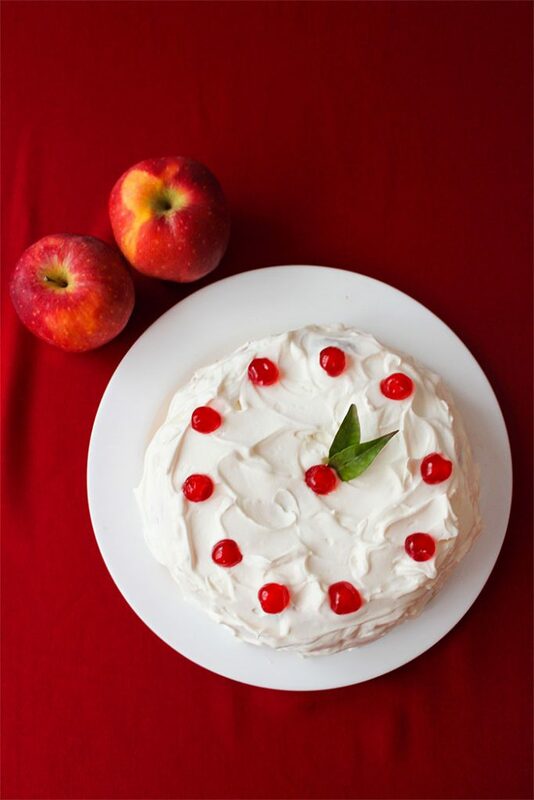 You can serve it simple, with no topping, or with some whipped cream and a few maraschino cherries, just to add a pop of color. The aroma that will fill your house when the apples are in the oven is amazing. Don’t forget to add a bit (or a lot) of cinnamon. Peel the apples and remove their cores. In a medium, oven-safe cooking pot, melt the sugar on low heat until you get a golden caramel. Coat the sides of the pan with the caramel. Put the pan in the oven and bake for 15-20 minutes. 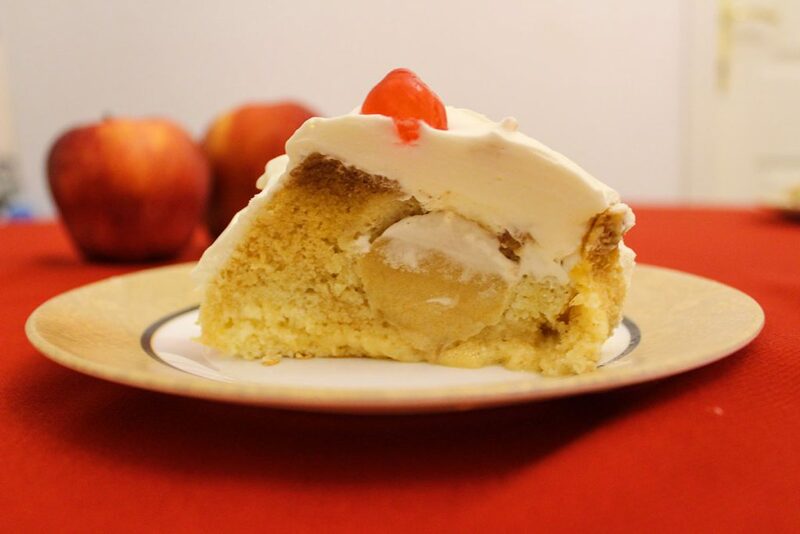 While the apples are baking, prepare the sponge cake batter. Mix the egg whites with a pinch of salt until they are semi-whipped, then add the sugar spoon by spoon, and keep mixing until the egg whites are stiff. Beat the egg yolks and fold them into the egg whites, just until they are combined. Sift half the flour over the eggs mixture, and fold it through. Repeat with the remaining flour. 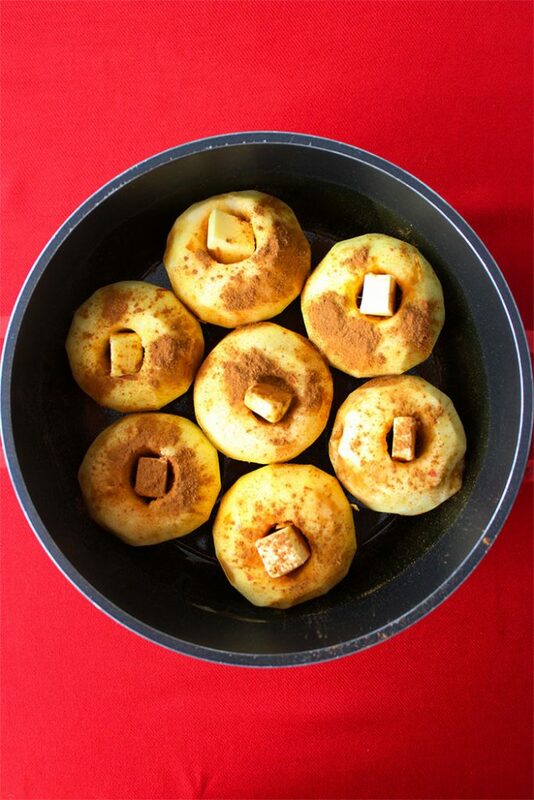 Take the pan with the apples out of the oven and lower the oven heat to 180°C (350°F). Pour the batter over the apples and distribute it evenly. Bake the cake for 20 minutes. Don’t open the oven door during the first 15 minutes. Take the cake out the oven and let it cool completely. Place a large plate or platter over the pan, and with a quick move, turn the cake upside down. Fill the apple holes (where the cores used to be) with sour cherry preserve. Before you whip the cream, make sure it’s very cold. The bowl that you use to whip the cream should also be cooled before using it. Put the heavy cream in the mixing bowl and whip it on medium speed for 30 seconds, then turn up the speed and start adding the powdered sugar, spoon by spoon. Whip it just until it becomes stiff. 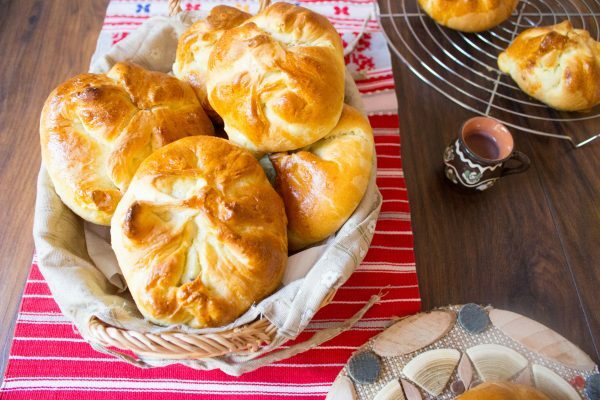 Don’t whip it too much – the cream can easily turn into butter. 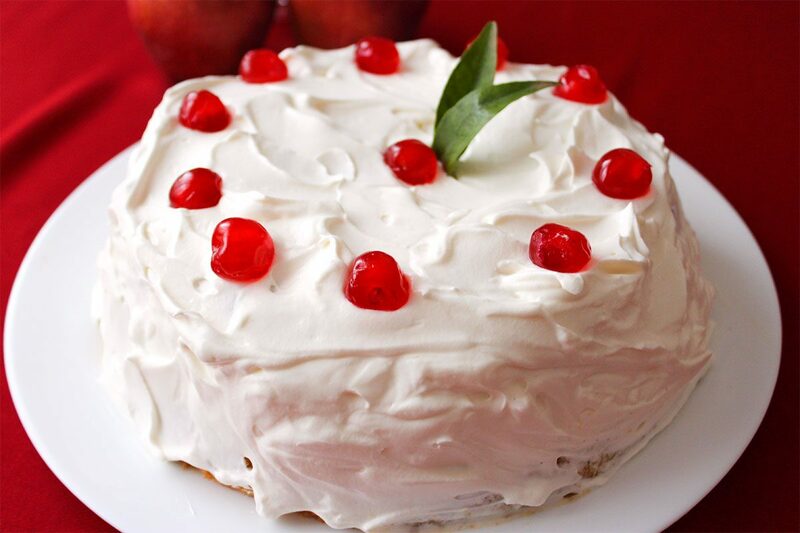 Using a spoon, decorate the cake with the whipped cream, and add some maraschino cherries on top.